I love hiking in beautiful places. On our way back from our anniversary weekend, Heather and I climbed up one side of a mountain off of Independence Pass. It was perfect weather. We were having a great time. Then one of my little prejudices crept in. 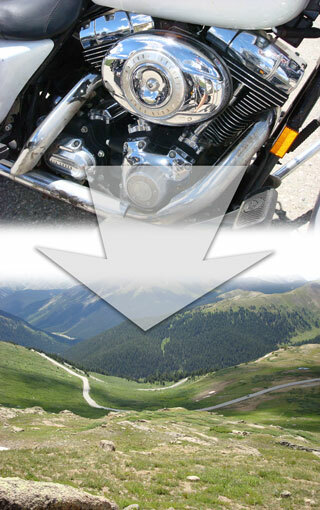 Maybe a mile from the road and 1000′ up, I heard a stream of Harley Davidson motorcycles. I support freedom of choice. But I also appreciate it when people think of others. That loud pap-pap-pap noise made its way into my otherwise pristine experience. I’m weak. Mufflers help me. Of course Aspen has a store exclusively featuring their wares. It seemed like all they had were short jackets. However, their website features stuff you’d see on the runway. I was tempted to run away. Anyhow, this also marks my very first ever embedded video. I always avoided doing that because I had friends in Nairobi who had very low bandwidth. But these days, very few of them visit this blog – so I’m adding a video for the rest of you. Update: I’d suggest clicking through to the blip.tv link – and even then, it’s pretty jittery. Apologies. Franck Muller makes watches. Or the company named after him does. 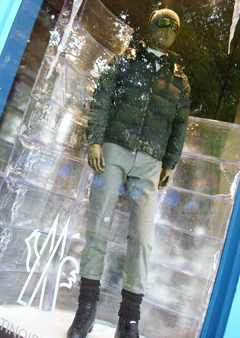 They are based in Geneva, Switzerland but have a dedicated store in Aspen, Colorado. 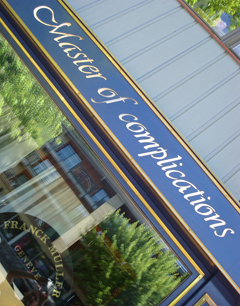 Mr. Muller was known as the “Master of Complications” – because his creations were very complicated – many have several dials and mechanisms to tell more than just time. They are works of art, if you like that style. I looked at the tag hanging on one in the window – $21,000. That is a complicated thing to grasp. Yes, Aspen attracts people who can afford more than one of those timepieces. Maybe one for each day of the week. Heather and I just got back from a long weekend. We celebrated our twenty years of marriage! That’s nothing short of a miracle, in today’s world. 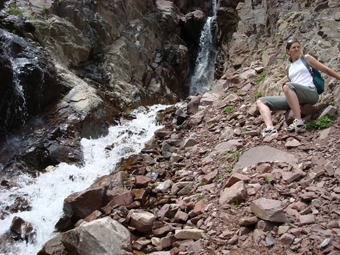 On Saturday we hiked up the face of one of the Maroon Bells, a mountain near Aspen. Our goal was to have lunch at a waterfall I had seen signs of but never been to. Not possible. The face was so sheer that there was no place for us to sit to have lunch! I was clinging to a rock while I took this photo. Heather was debating how to get back down to a safer place to descend. During our big hike, we encountered this massive slab of snow. Even though it was July 17 – and maybe 75 degrees – the snow still had a long way to go before it became water. That was the largest glacier I had seen at such a low altitude. (Last winter was one of the snowiest in many years.) 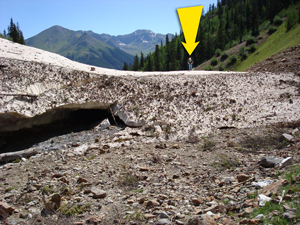 For scale, Jay climbed on top – he’s below the point of the yellow arrow. Takeaway: As you get frustrated with that situation that just doesn’t seem like it will ever change, be patient. It may take some time. And some warmth on your part may speed the desired change. 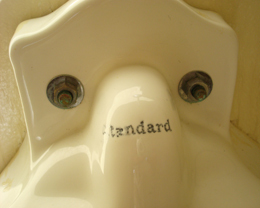 Rachel (8) requested that I put this in my blog. How could I refuse a plea like that? 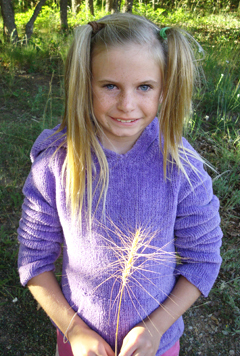 By the way, the amazing wheat-like plant she is holding had incredible polyester-like strands. And she did her own hairdo. In these turbulent times, many are focused on whether they are going up or down. In your life, career, marriage, the stock market, whatever. I certainly don’t know – for you or for me. Obviously we do need to keep a sense of optimism. But the one thing I do know is that I have to keep trusting God – the only rock I cling to. By the way, I took this shot of my two boys on their way toward the summit of Redcloud Peak, last week – 14,034 feet above sea level. I was so proud of them – no complaints the whole way. Jay even carried my day pack and his too! They both ran circles around me. 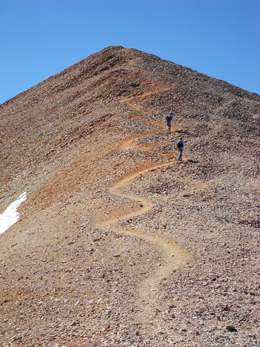 As most people do, we also climbed Sunshine Peak – Colorado’s lowest 14’er at 14,001′. The hike between the two peaks was nothing to be sneezed at – that added about three hours to our day’s exercise. Many of you know that I have been dealing with the loss of my mom. One of her great attributes was that she spent a lot of time in prayer. One of the aids to her motivation was reading books by those experienced in the art of praying. I knew that she had corrresponded with Corrie Ten Boom, the author of The Hiding Place. We were glad to find one of the letters my mom received from Corrie, while we were going through her stuff. If you haven’t read The Hiding Place, it’s a great true story of how Corrie survived life in a Nazi concentration camp. We enjoyed reading it last summer as a family.